Posted on January 25, 2016 at 11:24 am. The brand new Guns N’ Roses pokie is here and Guts online and mobile pokies casino are offering up to 50 free spins daily to celebrate, and an additional 20 spins if you’re a new sign-up – with no deposit required. From now until January 27, players can head to the online casino by following the links provided here, making a deposit and wagering on Net Entertainment’s latest release, Guns N Roses, to win free spins. You can do this every day up until the conclusion of the promotion with all winnings accrued wager free. The no-deposit 20 free spins offer runs until January 30, and grants new registered members free spins to use on King of Slots, one of the best online pokies on the Web. You don’t need to deposit any money at all to get the bonus – this offer is available to players from Australia, Canada, Finland, Netherlands, New Zealand, Norway, Sweden and the UK. Try out the brand new pokie and win yourself some free spins in the process – if you aren’t a member of Guts.com, simply click our links to sign up, get some free spins and make a deposit with the large number of deposit options available. We heard about the new pokie based on one of the biggest American rock bands back in February 2015, when Net Entertainment unveiled their plans at the ICE Totally Gaming Conference. Since then we have been waiting anxiously for the new pokie and it is now finally available at some of our favourite online casinos – including Guts. 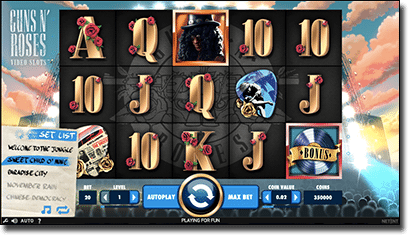 The pokie features 20 paylines across 5 reels and 3 rows and is based on the iconic band including Axl Rose, Slash, Izzy Stradlin, Duff McKagan, and Steven Adler. Fans won’t be disappointed with an opening clip of the band and all their popular tracks to pick from as the soundtrack to gameplay – you can pick from Welcome to the Jungle, Sweet Child of Mine, November Rain, Chinese Democracy, and Paradise City. We are yet to see this on a pokie before and we have to say it is a much better feature than just offering a mute option. But if you aren’t a fan of the band, you will enjoy what the pokie has to offer including a Free Spins feature of 10 free spins and a Pick and Click Bonus called the Crowd Please Bonus Game – there is also a Wheel of Fortune type wheel you are required to spin before entering the Pick and Click screen. There’s also Expanding Wilds, Appetite for Destruction Wilds, Legend Spins, and the Solo Multiplier – plenty of features to keep you entertained for hours. If you want to try out this pokie head to www.Guts.com now and score yourself some free spins in the process.